(IDEX Online) – Doug Hucker of the American Gem Trade Association (AGTA), is the recipient of the American Gem Society’s (AGS) most prestigious honor, the Robert M. Shipley Award. 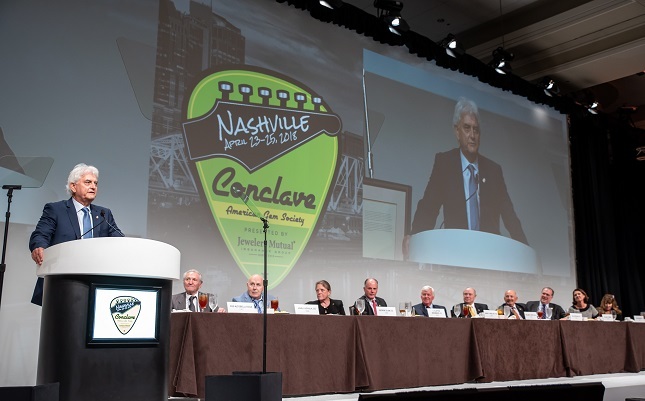 Hucker was presented with the award at the Society’s annual Conclave in Nashville, TN. Hucker received the award based on his commitment to the jewelry industry and because of his friendship and service toward the Society over the years. As chief executive officer of the American Gem Trade Association, Hucker represents the premier Association of United States and Canadian colored gemstone professionals. He also represents the AGTA in numerous national and international industry groups. In addition to his efforts to promote appreciation and enthusiasm for colored gemstones, he oversees the Association’s commitment to ethics, professionalism, and consumer protection. In 2016, Hucker received the Society’s prestigious Triple Zero Award at the annual Circle of Distinction Dinner. He was also the recipient of the 2015 Sallie Morton Award at the Society’s Conclave in New Orleans.